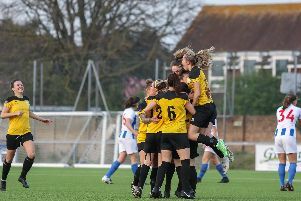 Molly Clark bagged a brace as Chichester City beat Plymouth Argyle 3-0 at Elburton Villa FC in the National League Southern Premier. The central midfielder caused havoc for the Pilgrims and was rewarded with two goals. Lauren Dolbear was put to the test alongside her defence but kept every attempt out as Helen Ogle found a third to seal the win and clean sheet. Bank holidays tend to bring the bad weather and the August one delivered as continuous rain battered the country. Manager Aaron Smith made a couple of changes to the side that beat Oxford United the previous week with Laura Ingram coming in for the injured Chloe Tucker and Chloe Melton got her first start . In the opening skirmishes Plymouth launched an early, strong attack with the ever dangerous Knapman leading the way the hosts forced Dolbear into a great save. Chichester found their rhythm in the poor conditions with Melton winning a free-kick in the Argyle half, Lauren Cheshire sent the ball back post where the home defence couldn’t clear it properly as Clark took her chance but was blocked by Ebony Dover. This was soon followed by another free-kick on the edge of the area however, Clark could only find the body of Pilgrims captain Katie Middleton. The goals soon came for Chi though following some good play Clark found the net twice in three minutes as the game headed to half-time. Her second goal coming from a great phase of play through the middle for Chi before Sara Tubby set up the central midfielder for a neat finish. Dolbear had to be on guard as the game ticked towards the break making two good saves one denying an edge of the area shot before parrying well from a Plymouth corner. The first chance in the second-half went to Argyle from a free-kick but it was quickly punched away by Dolbear as Chichester then went on the attack. Tash Stephens and Clark link up well in the middle feeding the ball into the box for Tubby who couldn’t convert her shot. Chi continued to press Plymouth and found the net again in the 84th minute as Ogle capitalised on a defensive error to smash home her first goal of the season. Despite eight minutes of additional time Chichester held on for the win and a clean sheet. Starting XI: Lauren Dolbear, Lauren Cheshire (C), Tiffany Taylor, Laura Ingram, Sharna Capel-Watson, Molly Clark (70’ Gemma Simmonds), Hollie Wride, Rebecca Barron, Sara Tubby (77’ Jade Widdows), Tash Stephens (61’ Helen Ogle), Chloe Melton.